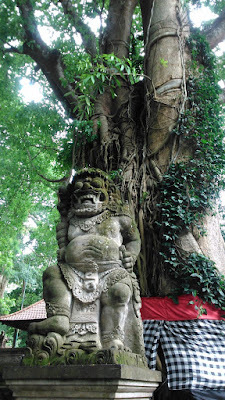 Today I will tell you about my visit to Monkey Temple. Still the story about my holiday in Bali. We're planning to go to Monkey Forest a day before, but sadly, a day before Ubud have rain, since morning, so we just stayed at our balcony room, enjoying the rain while playing games. Yeah, playing games. The day after, the sun shines, even not too bright, but at least no rain. 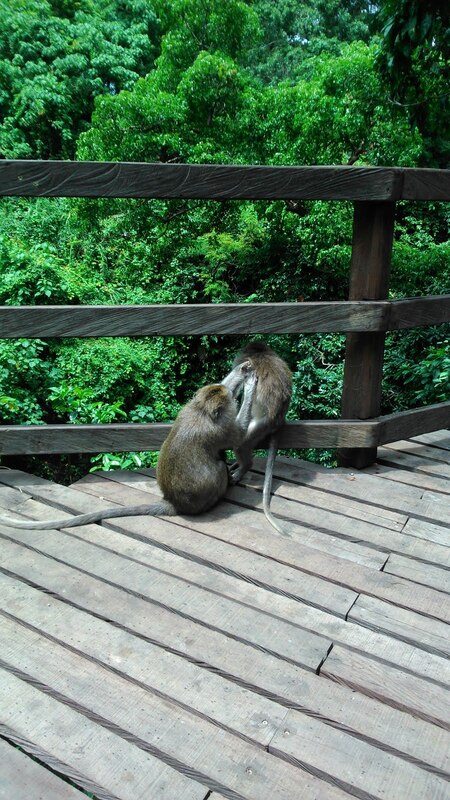 So we decided to go to the Monkey Forest place this day. 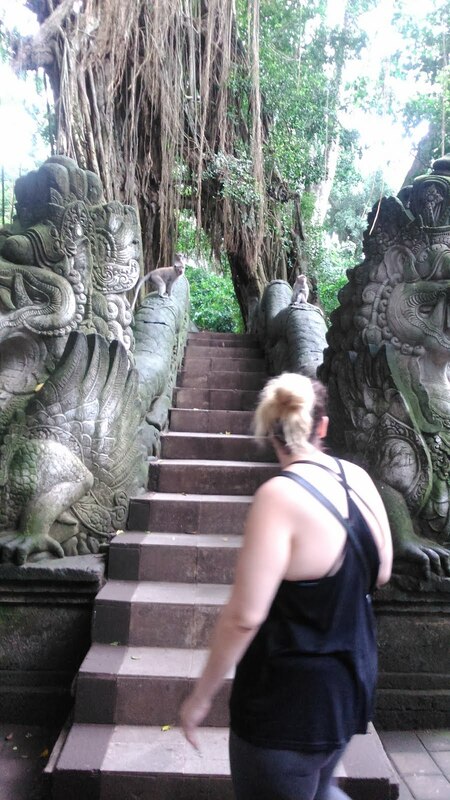 By riding a rented scooter, we went to the monkey forest. I'm really excited to go to this place. The weather is not really bad, not too hot, not too cold. So when we arrived at the place, just like usual, lot's of souvenir shop in the right and left road to the place. And, the best thing if you use two tire vehicle, you don't have to be worried, because the parking area for the motorcycle is inside the building in front of the main gate. 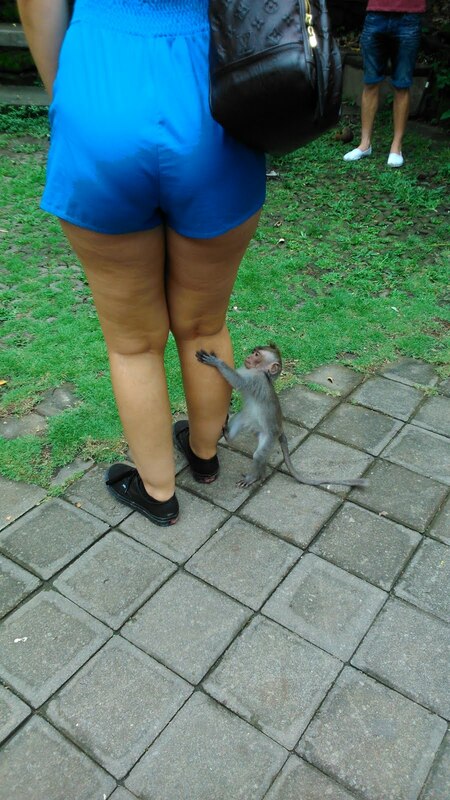 Tips,Because this place is the home of the monkeys, don't ever try to walk outside the pathway. Because, the monkey will thinks that you will disturb their "personal space". In this place, monkeys are the rules. Once you came inside, the pathway lead you to the "banana seller". It is funny, because it said you are not allowed to feed the monkey, but apparently, you allowed to feed them if you bought banana from the seller inside the place. 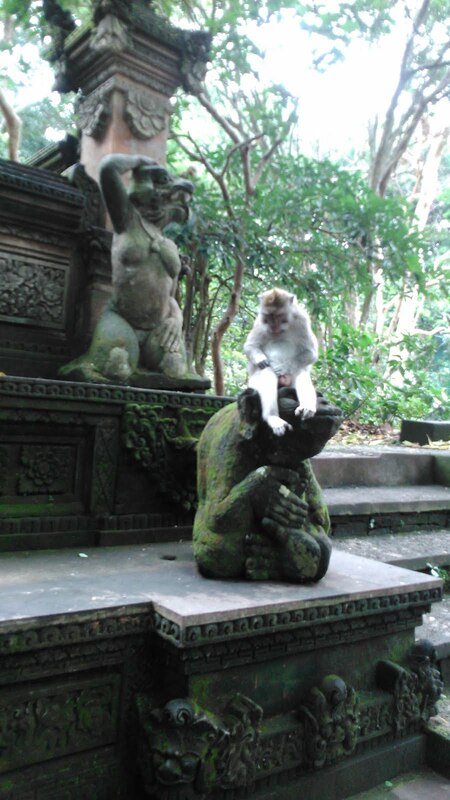 Monkey forest, or you can call it a Monkey Sanctuary. Is a place for lots of kind of monkey. 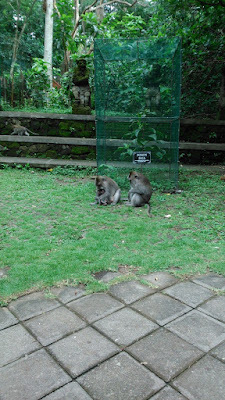 It said that the monkeys in here is sacred, so you will never ever allowed to harm them. You even can't touch them. So, no touch, nothing. But... it will be different if they are the first who touch you. According to one of the guardian there, you can't touch them, because they think you will disturb or harm them. The real name of this place is "Mandala Wisata Menara Wana", But most people know it as monkey forest, or sacred monkey forest. You know why... he he he. If you're decided not to use the tour guide, don't have to be worried, because inside the place, you will find a lots of signs (well in some places). And also maps to show how big the temple is and also where are you right now. Monkeys are free to touch you, BUT YOU ARE NOT!!! 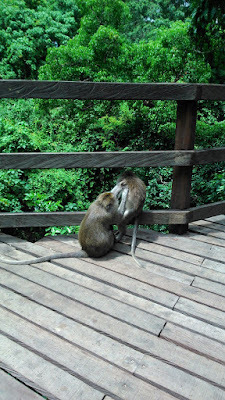 After getting afraid because of lots of monkeys suddenly "attacking" one of the tourists in front of us, because he bought banana, and laugh a lots because the monkeys are soooo mean it to get the banana. I think those monkeys never know the words "full because eating" because every time the tourist hold a banana, they will immediately attacks the banana... We moved into (looks like) the first center of its place. 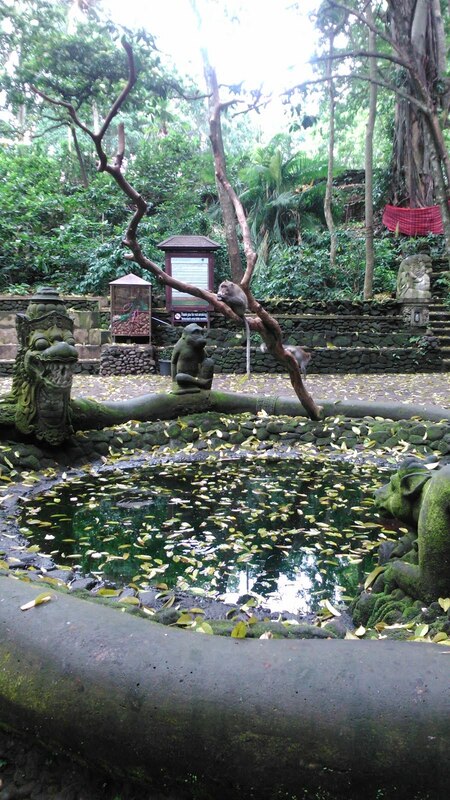 It's a big pond in the middle, of course you can see monkeys there. From that pond you can see the map and the road signs, so you can decided where you want to go next. We decided to go to the dragon bridge. It placed in the middle of the forest. 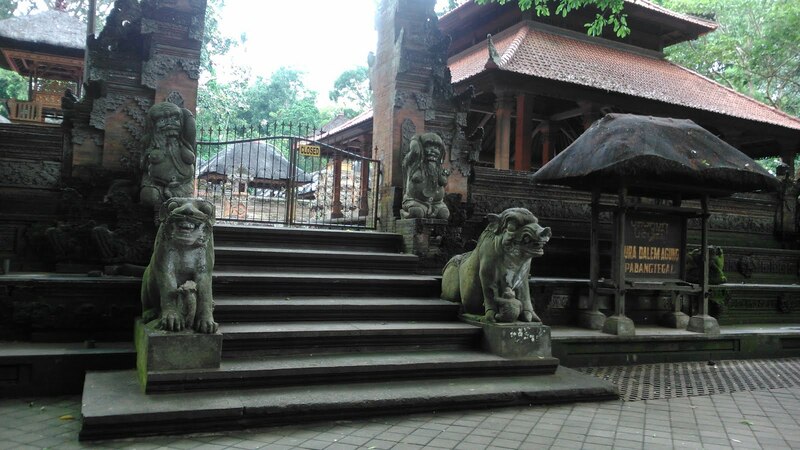 On your way , you will across the bridge and find more ancient statues. The dragon bridge is really a dragon shape bridge, at the end of the bridge. Want to take a picture of this bridge? You have to be very patient, because lots of tourists across this bridge, because this bridge is the only way for you to come into the sacred river. Yes, sacred river is at its way. 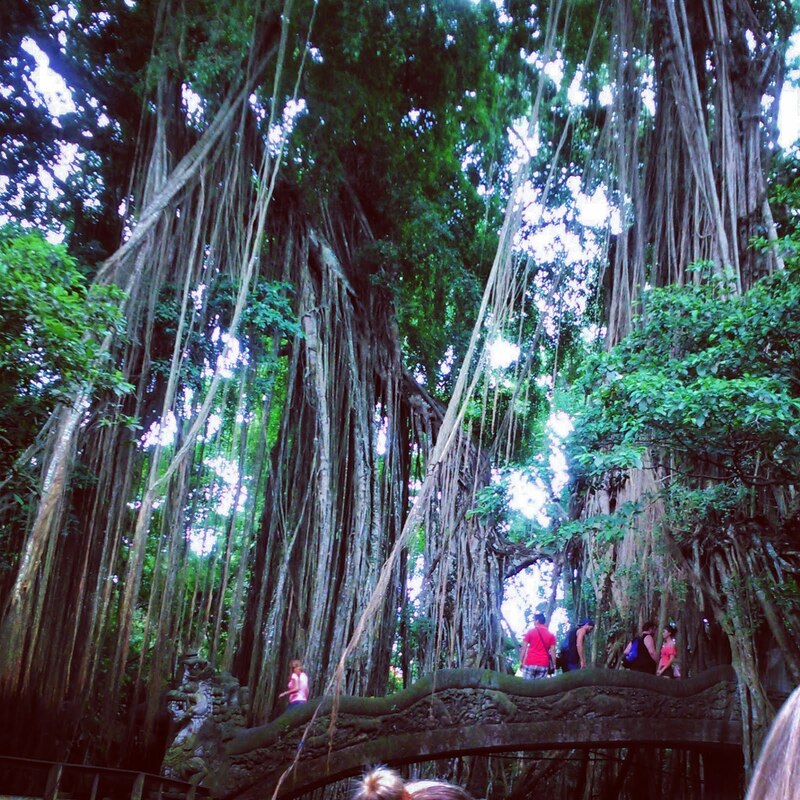 Don't worry about getting super hot, because big banyan trees are everywhere. Near the bridge at the right, you will find a small sacred fish pond. 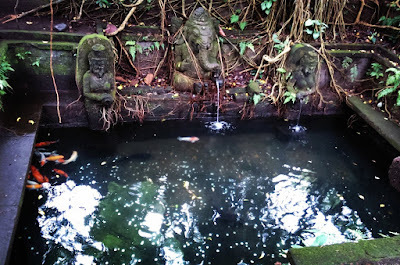 You can find lots of koi fishes inside this pond, and huge catfishes. We counted there are two or big catfishes there. This pond is also full of pennies. I'm guessing these pennies are thrown by people who wished something in their life. No, I didn't throw the penny inside this pond, but we watched one of the staff was stood inside this pond, and took all the pennies inside the pond. Yep, nobody can come inside the pond except the staff. Behind the fish pond, there is a small temple, small and old. From what we read, this temple is used for pray for the Hanoman God, sometimes. Hanoman is the monkey king with white fur all over his body in Hindu belief. 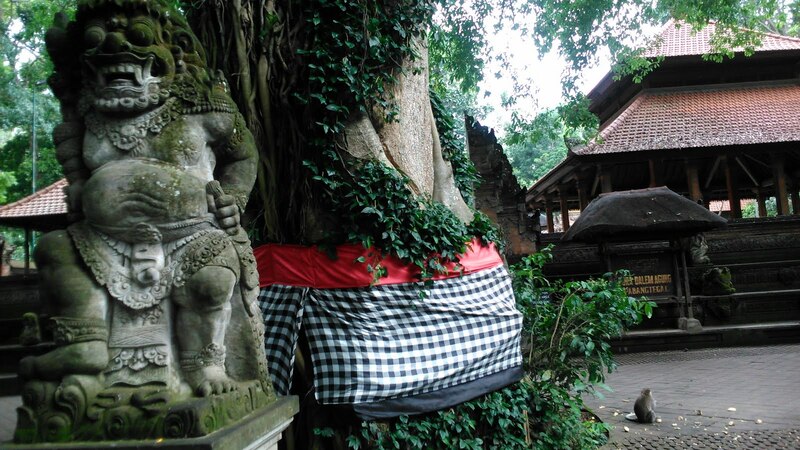 Yes, this temple is also sacred. be careful, the way is slippery, and always wet. 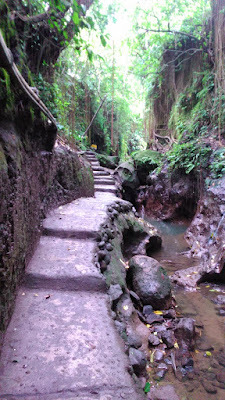 a path to sacred river, so small. Be careful with your step! The sacred river is so clean. Just be careful, because the path is just enough for one person. So if you meet another tourist from front, very careful ya. And, sacred river is a dead end. At the edge of the path, you can find lots of big rock, and if you lucky, you will find a big lizard bathing a sunlight. After you finish enjoying your view at the sacred river, you have to go back to the same path you've come, because there's no other way. Again, be careful when you step at these path. 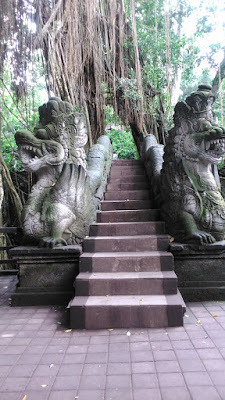 They will give you a long wooden path at the left side of the dragon bridge. Yep, after you go back from the sacred river, you will be lead into the dragon bridge again. We decided to go into the wooden path. My boyfriend stopped at the middle, it seems he found something interesting. Yep, he found two big statue of komodo dragons. 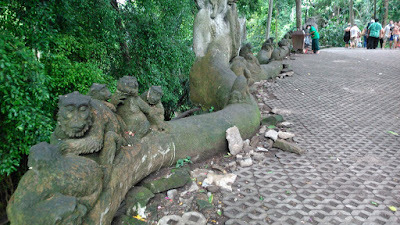 After that, we keep on walking the wooden path, while sometimes saw monkeys swinging around at the banyan's root. The banyan trees in here are so big and old, you will see the roots are everywhere, and it help you to see the monkeys. Move followed the wooden path, it will lead you into the art center. I assume this building is rented for whom who want to held their art exhibition. 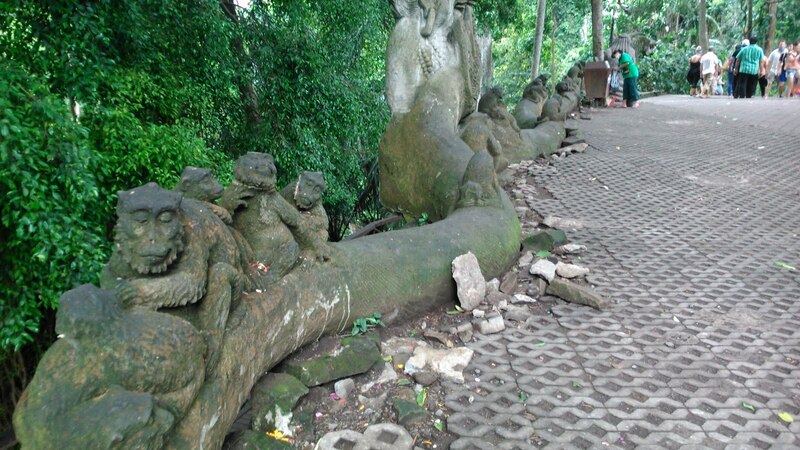 You can take a rest in this area, while watching the monkeys playing around you, or just admiring the green forest in front of you. We decided to move forward, and we find a bigger temple and it leads into the exit ways. Again, we can find the banana seller in here. So if you want to try to feed the monkey, you can buy banana from the seller. 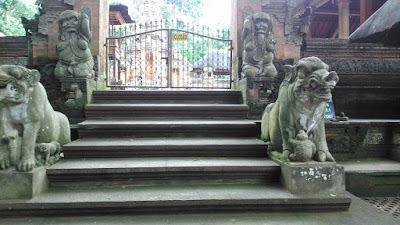 Too bad, the temple is closed for public, it said the temple is only open for them who want to pray inside it. So, we can come inside the temple, but we allowed to take a temple picture. 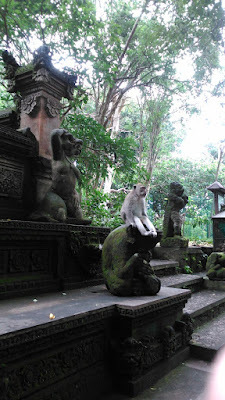 Of course with lots of monkeys around us. In here, monkey is free. You will not find monkey inside the cage. 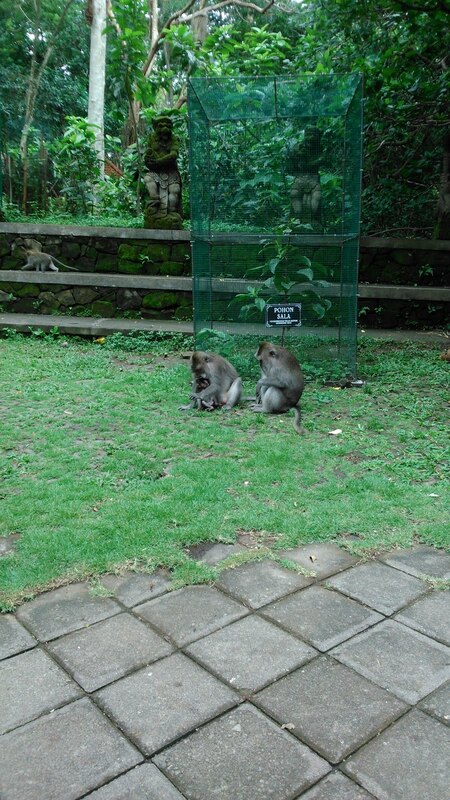 Instead of watching them inside the cage, you will walked around with the monkeys everywhere. Be careful of your belonging, the monkeys are really not tamed. They free to touch you, but you are not allowed to even touch them. As long as you are not showed any strange behavior that will lead their curiosity, you'll save. I have seen a tourist almost lost her ear and bag, just because she thinks the monkey is tamed, and tried to take selfie with that old monkey. But.. it's a bad mistake. The monkey suddenly grab her long earrings, and her bag. After you came out from this sanctuary, you will still can see the monkey outside the sanctuary. 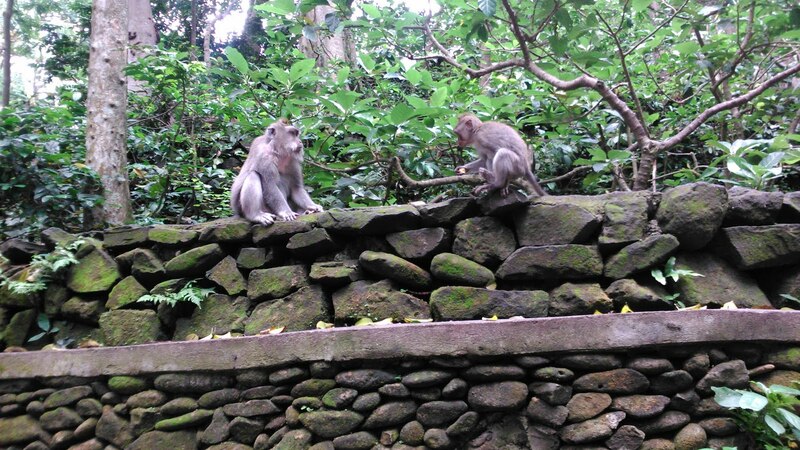 But how people react of monkey outside the sanctuary is really different. Inside you will try hard not to disturb the monkey, but outside, you will find lots of seller try to drive the monkeys away from them. Oh yes, while you are outside, you still can find monkey everywhere. That's our experience exploring the monkey sanctuary. It's so wonderful and tiring, because it's soooooooo big. Good luck to find it, and enjoy all the things you find there.